It was exactly a year ago today that some 70 people, mostly unknown to one another, entered a room above a pub in Waterloo, sang some chorales, motets & chansons, drank a fair bit, then went home happy and slightly less unknown to one another. Little did we imagine then that a year later, this mad project would still be going, stronger than ever, and with an increasing circle of polyphony enthusiasts who like a good pint. Last night we celebrated the occasion with another group of around 70, working our way through a review of some of the best numbers that we covered over the first 12 months of our existence. Highlights for me were the double-choir Duo Seraphim by Gallus (you should have heard it from where I was standing!) and an utterly magical rendition of Byrd’s Ne irascaris/Civitas sancti – still tingling at the memory of Sion deserta facta est. The chorale from BWV 10 was another goosepimple moment, though it’s fair to say that a huge crowd trying to busk their way through the intricacies of BWV 437 after several pints was probably a step too far – one for a future after-hours session, perhaps. If you are on Twitter, you’ll already know that we have just launched Counterpint, PDtP’s sister event that’s designed to allow singers who can’t make Mondays to join in the fun – details here and you can also sign up here. As we enter our 2nd year, I want to say a huge thank you to the hundreds of people who have sung with us so far, whether it was just the once or on a regular basis, whether you came from around the corner or from further afield, whether you are a professional singer or someone who hasn’t sung since school, this event would be nothing without you and I am incredibly grateful to you for turning up each month. Well, at a point I was thinking of sardines, but what a cracking evening #PDtP. Happy birthday and thanks for letting us share the fun! @octaviansingers @PubPolyphony also a mini contingent from @BeckenhamChoral having a ball at the back! @FarnhamYouthChr @PubPolyphony marvellous. Impressed .. Need a conductor 😄??? 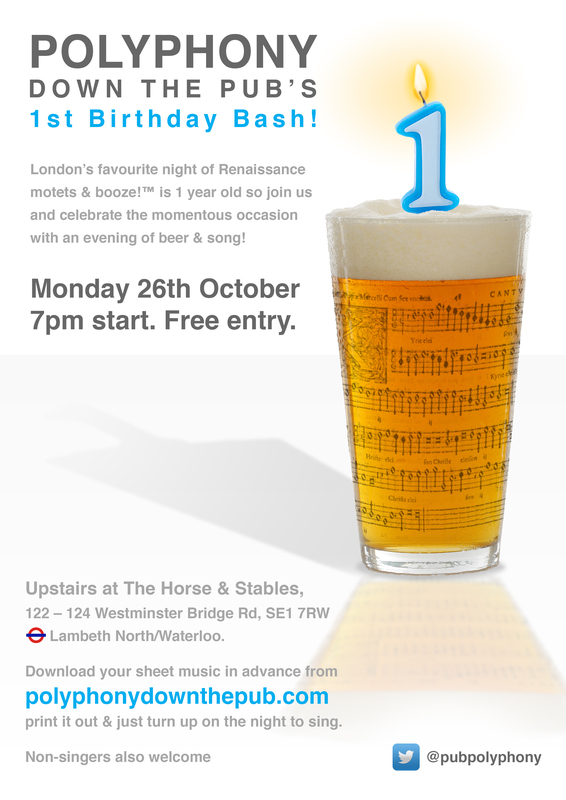 If you like pubs and singing Renaissance music (and why on earth wouldn't you? ), then I highly recommend @PubPolyphony. Great session today. Posted on October 27, 2015 2 Comments on Happy Birthday to us! Have just checked the pre-registrations for Monday’s birthday extravaganza and it looks like we are going to have a verrrrrrry* packed room on the night, which is both brilliant and terrifying. I have spoken to the pub about the lighting but I think we need to prepare for the same low levels that we have had in previous sessions. It’s therefore best for anyone who struggles to read small dots by the equivalent of guttering candlelight to consider perhaps bringing along some sort of pen-torch aid (though try not to blind your neighbours). Also, please do make sure you have your music downloaded in advance as the pub wifi couldn’t cope last time around. Speaking of which, don’t forget to grab your music from here, and double-check that you have the correct edition of the Casulana, which was updated on Wednesday. In terms of splitting voices, Altos, you’ll be singing the Quinta Pars of the Josquin, with a bit of help from the lads on the first phrase, and we will probably split you between the Countertenors (i.e. the 2nd and 3rd lines) of the Parsons. Everyone will get to sing both choirs of the Gallus at least once, which is nice, and I urge you all to have at least a quick peak at BWV 437 as its glories are directly proportional to its tricky bits. That’s it – have a great weekend and see you Monday night! *How many extra consonants are too many when you are trying to be realllllly emphatic? Forget Bond – it’s Bach who is back! Back in July I posted a mournful note to say that the Bach Vespers series at St Mary-at-Hill was possibly no more, owing to the departure of Cantor Martin Knizia. I am very pleased to share the far more joyful news that the Music at Hill team have now appointed a new cantor, Erik Eichelberger, who will be leading a performance of the monumental BWV 80 Ein Feste Burg this coming Sunday, October 25th. I am sure Eichelberger will prove to be a worthy successor to Knizia and it’s great to see that many of the fine musicians from previous vespers will be returning. Full details are here and I strongly encourage anyone who loves the choral music of JS Bach (and ovpp performances of it in particular) to get along to the service. In other JSB news, I have just discovered the fantastic allofbach.com, although no doubt all of you digital hipsters were way ahead of me on this one. It’s a beautifully simple idea from the Netherlands Bach Society: every Friday, a video of one of Bach’s works is uploaded to the site – and all for free. In addition to the high quality performances and video, each work is supported by a background article, the text and translation of the vocal works and (as if that wasn’t already enough) supplementary videos of interviews with the musicians, providing even more insight into each work. So far they have uploaded some choral works (various cantatas, the Magnificat and even the St Matthew Passion), organ preludes and a couple of concertos among others – and it’s wonderful to think that by this time tomorrow there should be a new work up there! The Netherlands Bach Society rightly describes it as a gift to the world – it’s certainly one of the most extraordinary and ambitious acts of cultural generosity I have ever come across – so let’s all share this gift as wide as we can and get the whole world immersed in Bach! Posted on October 22, 2015 October 22, 2015 Leave a comment on Forget Bond – it’s Bach who is back! A couple of weeks back we were all on course, with a carefully put together schedule to release the set-list in manageable chunks, thereby continuing to whet your collective appetite and get you all even more excited about the PDtP Birthday celebrations. Then an impromptu trip to Ireland got in the way, with its distractions of the Mayo coastline, the Holy Mountain, medieval monasteries, County Kerry and beer, and the plan quickly fell apart. I hope you’ll agree that the works I’ve chosen are some of the very best numbers that we have sung over the past 12 months and there should be something in there to suit all tastes, just as long as those tastes are centred around 16th century choral music and Lutheran chorales. One thing I do need to point out is that we still have a very peculiar distribution of voices signed up for the night, with roughly the same number of altos as all other voices combined. It would therefore by great if any sopranos, tenors & basses who are definitely coming could sign up so that the nights leading up to the 26th become slightly less sleepless for me. Also, as a Plan B, if any altos who are comfortable up at the higher end of the register could be prepared to help out the sopranos then you will be showered with praise and glory on the night, as indeed you are on most nights anyway. Hope you are looking forward to our anniversary celebrations; just under 3 weeks to go! In a change to our usual way of doing things, I’ll be sending links to the sheet music over the next couple of weeks, starting tomorrow or Friday. The trickiest numbers will be in the first batch, just in case anyone wants to swot up in advance. Also, as part of the celebrations, I’ll shortly be announcing some possibly exciting news so keep your eyes peeled. Finally, I’d like to add to our About page some quotations from PDtP regulars about why you come to the sessions, what you get out of them etc. If you would like to share some brief thoughts then please use the comments box at the end of this post or drop me a note via the About page feedback form. PS Altos are still way ahead in numbers, so Sopranos, Tenors & Basses, sign up now! Don’t forget to sign up here if you haven’t already done so, as it’s going to be a great night!